Cipher System is a melodic death metal band (with a sprinkling of metalcore) hailing from, of course, Sweden. They debuted in 2004 on Lifeforce Records with the studio album Central Tunnel 8 although had released a few demos as far back as 1995 and a split album with By Night beforehand. A large amount of member changes and record label change seemed to preoccupy the band between the first album, and the object of this review. Cipher System’s second studio album, Communicate the Storms was released 7 years later, in 2011 on Nuclear Blast and I can only hope there isn’t a 7year wait until the next as this isn’t too bad at all. The album is a good length coming in at 46 mins and 33 seconds long over 10 tracks (and a 1 min 30 sec bonus track). The album follows the traditional “Gothenburg” style you would expect from a Swedish melodic death metal band but does add keyboard mood and effects played by Peter Engstrom to tailor their sound. The guitars and bass feel “heavy” and “crashing” in a good way, the drums are loud and clear and the vocals, sang mainly by Karl Obbel with backing from guitarist Johan Eskilsson, are strong and aggressive. All together the album feels well produced and modern. The first track is called 7 Inch Cut and starts off with a keyboard tune before slow paced intermittent guitars and aggressive singing join in, the song picks up speed before slowing down for a small solo and then melodic singing. The pattern continues throughout although the pace of the song continues to speed up until ending with an acoustic sound. All in all, not a bad song but feels a little disjointed as a song with too many changeups in pace and rhythm for my liking. Track 2, Forget To Forgive, jumps straight in with a catchy heavy guitar riff played at pace, vocals join in along with the keyboard where the song slows down slightly over the verses and picks up again quickly. The chorus is exceptional with melodic singing by the backing singer with aggressive vocals layered on top. There is even time for a “spoken word over drum beat” section leading into the angriest part of the song so far. Excellent track! Track 3, Communicate The Storms, has an epic beginning, starting with a wavy guitar/keyboard, followed by a scream that leads straight into an all instrument riff. The typical pattern of slow down followed by speed up and aggression continues. The vocals are particularly heavy and the drums are played at fast pace. There is a very short melodic chorus but this song focuses more on riffs and aggression and is better for it. Gods Terminal is next and starts with a short keyboard intro before picking up pace to join in with the guitars. The song keeps up the pace all the way through and any melodic singing is muffled behind lead guitars and growls. The keyboard is used well here, adding atmosphere while never being overly prominent. End My Path is the fifth track on the album and is quite effect/keyboard heavy at the start, a little too much for my liking really, but guitars and growls soon takeover and the outcome is a solid song with some ear-splitting screams and mosh pit inducing riffs. Objection is track 6 and has a slower guitar intro followed by an irregular feeling riff, an initial verse of just keyboard and drums with shouting over it that works fine but you do find yourself looking for the guitar. Luckily that verse is short and when the guitars join in, they take over and form an extremely heavy track with a very prominent bass sound. Until a weird keyboard effect plays out the last few seconds. The Stairway is next and jumps straight into aggressive, fast paced thrashy metal. The drums are blistering and the chorus is catchy, there is even a short guitar solo that builds up to more anger in the second phase of the track before the thrash returns. The pace is relentless and the song closes out over a wonderful little solo. Currently my favourite track on the album. 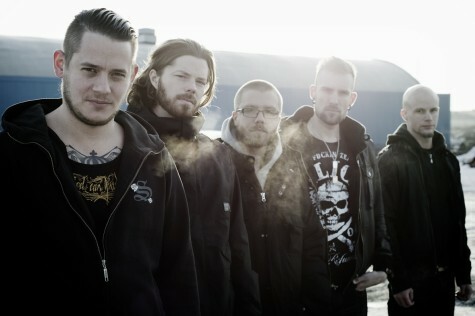 Track 8, A Lesson Learned, again focuses more on the death metal element of their genre. The vocals are raspy, the drums are pacy and the guitars are hammering out short sharp riffs. Suddenly around half way through the pace drops and we have short very slow guitar solo that lasts for around 20 seconds before it explodes back into life (or death?) until the end. Project Life Collapse is the penultimate song on the album and has a very Bodom feel to the intro with pacey guitars and keyboards working in tandem before the vocalist raises the bar a little with the most impressive shouting/singing so far on the album. Quick paced and angry with intricate guitar riffs fading in make for a very typical but good melodic death metal track. The final proper track on the album, The Failure Starts, starts with a bang with a drawn out scream over guitar. There is a fast empo throughout the verse with a slight slowdown before and after each chorus. The chorus itself is a mix of melodic and aggressive singing. A small spoken section leads back into a heavier and faster section and then back to more riffing. You get a nice ending guitar solo which is more lengthy then any prior ones and fades to a close. There is also a 90 second long bonus track called the Universe On Hold which is mainly just keyboards and effects and I lost interest in this very quickly. Despite a few songs sometimes feeling like there is too much going on and I could have lived with fewer keyboards it is a very decent album. I think the opening song was a poor choice as it is one of the less strong ones on the album and the bonus track is unnecessary but aside from that, there is some real quality metal going on from some obviously talented guys. It isn’t groundbreaking by any means but it is good and I will watch out keenly for future releases to see if they can build on this promising album.